This issue of The Flash picks up on a powerless Barry Allen (as noted in last issue and in the most recent Dial H) attempting to stop a radical group from breaking the Trickster out of prison. What can Barry do without his connection to the Speed Force? Turns out, quite a lot! SOME SPOILERS AHEAD! PLEASE READ THE ISSUE BEFORE MOVING FORWARD! As issue #19 picks up, we see Albert and Marissa checking out televised reports of the prison breakout…on a brand new 60″ TV? There is no time to figure this out, though. With Gomez not around, Albert and Marissa take her dad’s boat across to the prison, courtesy of Albert’s Turbocharger powers. In the prison, Barry has managed to get his hands on all the old weapons that once were used by the Rogues…which gives him his one real hope against a prison full of criminals and a radical group called the Outlanders who have broken in to grab Axel. It is fun watching Barry trying to master the Weather Wizard’s wand and throwing boomerangs in an attempt to stop this attack. Meanwhile, Albert has gotten into the prison and is attempting to use his Turbocharger powers to help. It seems that the way Turbocharger’s powers work isn’t related directly to speed…but rather to “amping” up any technology. The boat that once belonged to Marissa’s father is now a jet boat. Any weapon becomes a futuristic high-powered armament, and the system that locks the prisoners in their cells…uh, sorry about that one, Albert doesn’t have great control over his powers just yet. But, thankfully Barry and the Rogues’ tech arrives just in time. There are several reveals that hit in short order here, and for them you’ll have to read the issue. What I can tell you is that Barry regains his powers after the main issues are resolved, and that he is able to determine a bit about what happened to him. He and Cyborg have an interesting coversation afterward in the Watchtower. And, we see the new Reverse Flash doing something that will definitely have ramifications for anyone touched by the Speed Force. Brian Buccellato wrote most of this issue on his own, with Marcio Takara on pencils and inks. The last two pages were co-written with Manapul, who also handled the pencils and inks for those two pages. Buccellato does a great job with a powerless Barry, pitting him in an almost MacGyver-esque manner against both the Outlanders and a prison full of inmates. It is a measure of Barry’s true heroism that he pushes onward, knowing that he is completely vulnerable. It is impressive to see him literally live by his wits and to see if and how he can triumph in such a difficult situation. Marcio Takara does another great job on the artwork for this issue – we have not missed a beat during Manapul’s two-issue break from regular artwork in the series. As for the last two pages…those were added once DC decided that The Flash’s “WTF” cover would show the Reverse Flash one issue earlier than M&B originally intended. While the change in the ending of the book left the wrap-up of the issue’s main story feeling a little truncated, those last two pages certainly turn the cover into more than just a stunt – and they set up what should be an amazing story arc with the New52 Reverse Flash. 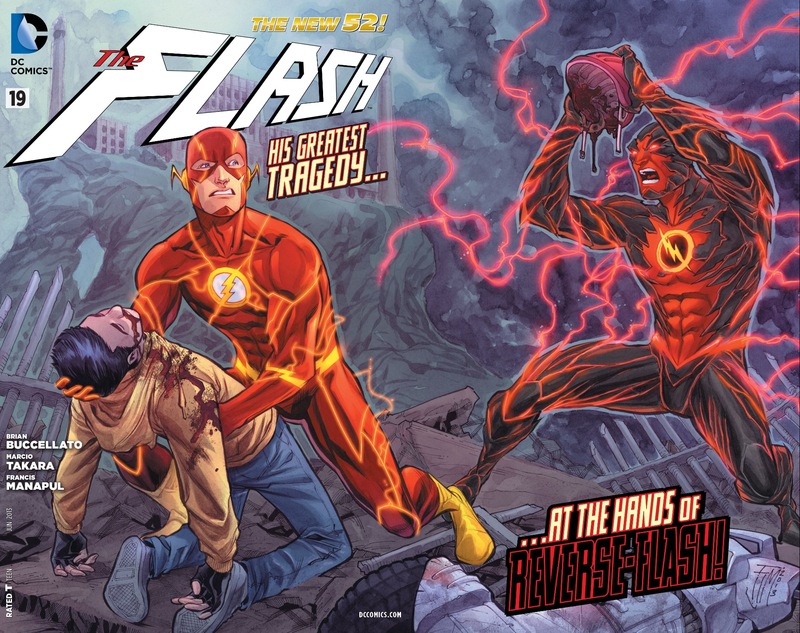 Flash #19 is an interesting piece that shows Barry at his best, even without (maybe especially without) his powers. 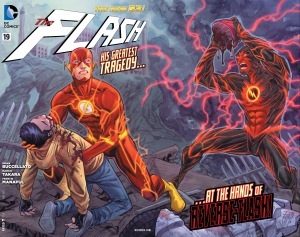 It is well worth the read, as we get ready to buckle in for the next major story arc with the Reverse Flash. This entry was posted in Reviews and tagged Brian Buccellato, Flash, Francis Manapul, marcio takara, Reverse Flash, Rogues, Trickster on April 24, 2013 by Ed Garrett. It’s Anzac Day today, and a public holiday so I won’t get this issue until tomorrow. Yeah, it took me a bit of effort to make any sense out of that, too. The best I can do is “his power temporary slides things forward on their ‘evolutionary’ timeline”. Which is moronically Silver Age, but there it is…. I can’t be the only person who thought this issue – and the two-parter as a whole – was poorly written and overall pointless, right? Dont think it was that bad. Not a huge fan of the stand in artists. The story seemed filler ish like it was just biting time for the reverse flash arc. The old rogue weapons and the reverse flash ending elevated it above pointless. I thought it was a bit choppy, but I’d hardly call it filler. A big part of this story was showing you what’s been going on with the speed force survivors, which is going to figure prominently in the Reverse Flash story. And the other side was basically Die Hard starring Barry Allen. That’s got its own appeal whether it connects to other stories or not.